The Potomac River, where it separates Arlington, Virginia, from Washington, D.C., is not every fly angler’s idea of nirvana. There are treatment plants pumping in less-than-pure water, the occasional shopping cart to negotiate while wading, and nary a rising trout in sight. 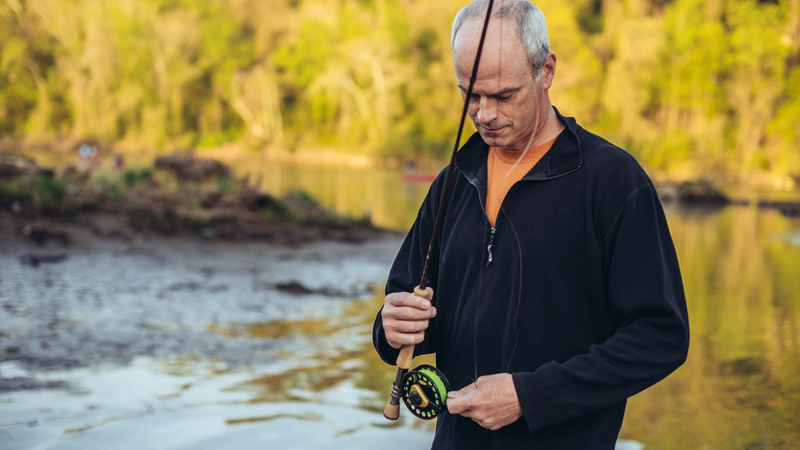 Yet whenever he can find free time, Chris Wood ’88—CEO of the nonprofit organization Trout Unlimited (TU)—can be found casting flies into the Potomac’s rather murky waters. There are a number of fish here, after all, that will take a fly. And here, in proximity to the citadels of power, Wood is strategically situated to continue his work protecting cold, clear-flowing rivers elsewhere—in the mountains, the north woods, the high desert canyons of the West—the rivers that are home to the 25 species of trout that can be found in the United States. Fly casting in these urban environs—where the scenery isn’t exactly bucolic—Wood exudes a genuine sense of positivity. It’s an outlook that might seem a bit Pollyannaish when exhibited by someone else, but one that comes naturally to him—whether he’s buttonholing legislators, taking donors fishing, or staking out a middle ground between fourth-generation miners and take-no-prisoner environmentalists to protect a high mountain creek. After he graduated, Wood worked a couple of menial jobs back home in New Jersey, but he was restless, and near the end of the summer of 1988, he headed west to Alaska at the urging of Mick Kelly, a college friend. One day Wood went salmon fishing. “I had my 7-weight, a pair of brand-new rubber Ranger boot-foot waders, and a handful of flies,” he recalled. “As I walked up the bank, I looked down into the river and saw these gigantic fish, much larger than any I’d ever seen. On closer inspection, they had these grotesque hooked jaws, and their bodies were covered in gnarly sores. Being a Jersey kid, I guessed that there had been a terrible industrial accident—a train must have fallen off a trestle and dumped chemicals into the river, disfiguring all the fish! I continued upriver, being careful to avoid what must have been acid-laced water, and I came upon a guy who was wading into the river with a rod. “‘What are you doing?’ I called out, hoping to alert him to the chemical disaster. He looked at me like I was crazy and said, ‘I’m fishing.’ ‘What happened to the fish?’ I called back. ‘They’re salmon,’ he replied, shaking his head and returning to his angling. I walked back to the car and drove into town and took out a book on salmon from the local library. I understood now what I’d seen, and was fascinated.” When he read soon after of the diminished runs of sockeye salmon in Idaho, he decided that he wanted to help. Wood subsequently moved to Idaho, where he landed a job with the research division of the U.S. Forest Service. When his mentor was named chief of the Forest Service in 1997, Wood followed him to D.C., assuming the role of senior policy and communications advisor. At the Forest Service, Wood helped orchestrate a landmark achievement: the architecture and passage of the 2001 Roadless Rule, which prohibited road construction and timber harvesting on 58.5 million acres of roadless areas on National Forest System lands in 39 states. Roads in undeveloped natural areas pose considerable threats to surrounding ecosystems, especially streams and rivers. Beyond increased human access, road construction—and the timber harvest that often follows—creates significant erosion, clogging critical headwaters with sediment and affecting water quality. Fewer trees mean less shade, which translates into higher water temperatures. The compromised conditions in the headwaters have an adverse impact on habitat for fish and other species that call those streams home, and warmer, dirtier water flows downstream, affecting lower reaches of the watershed. Protecting headwaters is a key component of protecting coldwater fisheries, which made Wood’s move to a new job and new organization in 2001 a natural progression. Trout Unlimited was founded in 1959 on the banks of northern Michigan’s Au Sable River by 16 disgruntled trout anglers. Led by George Griffith and Art Neumann, the founders were frustrated with the state’s practice of stocking rivers with “keeper-size” trout that were bred in hatcheries, believing that the rivers, if left to their own devices, could produce superior wild fish. Furthering their cause by compiling the best available scientific data, the nascent TU was able to convince the Michigan Department of Natural Resources to begin managing the state’s rivers—at least some of them—for the well-being of wild trout. The motivation was, no doubt, angler-centric. But there’s no question that the ecosystems benefitted too. Watching the tide turn in Michigan, anglers in Wisconsin, Illinois, Pennsylvania, and New York soon founded TU chapters. A one-off initiative had become a grassroots movement. When I first became aware of Trout Unlimited in the early 1990s, the group—which had grown to approximately 50,000 members and had an annual budget of $2.5 million—seemed to be a well-intentioned, though not all that serious, organization. (Well-to-do volunteers sponsored occasional litter pick-ups on local streams, offered once-a-year fly-casting lessons to the Boy Scout troops, and held fly-tying/Scotch-drinking klatches in the winter.) That changed soon after under the guidance of a new CEO, Charles Gauvin. By the end of his tenure in 2010, TU had tripled its membership, increased its budget to $26 million, and grown its staff to 130. Wood was hired as director of conservation in 2001; by 2010, he had been elevated to chief operating officer. Upon Gauvin’s retirement, Wood was tapped to take his place as CEO. America’s native trout can use all the dynamism that can be mustered. Of the 28 species endemic to the country, three have gone extinct in the last century; of the remaining 25, over half occupy less than one quarter of their historic habitat range. Loss of forests, loss of wetlands, diminished water quality all contribute to this demise. The well-being of native trout—creatures that need cold, clean water to survive—is a bellwether for the health of the aquatic environment that ultimately affects anyone who likes clean water to drink. (We all live downstream.) The loss of a species—should it come to that—also frays at what ecologists call the tapestry of life, how all life forms are delicately, if inexplicably, connected. Chris Wood’s leadership has gone to great lengths to shed the organization’s rather aloof image and make TU a more central part of trout fishers’ lives. “Before Chris came on board, TU was considered—and considered itself—only a conservation organization,” Christiansen continued. “It was all about clean water and fixing streams. Chris saw TU’s role, at least in part, as making the fishing experience better. This wasn’t turning the organization away from its conservation ethos, but turning it a bit more toward being a sportsperson’s organization. Chris has an everyman quality, and he brought that to TU’s personality, along with his energy. He brought the organization vibrancy, and this was important for capturing the new generation of anglers.” Anglers who would hopefully become conservationists. In the eight years since Wood assumed leadership of Trout Unlimited, the organization has doubled in size again, with a budget of $50 million, 240 employees, and 300,000 members/supporters in 400 chapters around the country. Each chapter averages 1,700 hours of volunteer time. The federal government's current efforts to transfer public land to state ownership is a cynical attempt to sell off these lands. So Wood got to work crafting a narrative, one that he can now recite by heart. On that day in the conference room, he sketched out the organization’s mission matrix. “On the highest level,” he said, “we protect high-quality habitats, which are the sources of the coldest, cleanest water,” writing PROTECT on a large sheet of paper that he had taped to the wall. “These are your roadless areas, and much of the work here occurs at the federal level. “Next, we reconnect.” (RECONNECT is added in black marker.) “Fish need to move depending on river conditions, and we work to connect habitats. This is a plumbing issue—it might be ensuring that river flows are maintained, or removing dams. Most of this work happens at the state level. “At the bottom, we restore.” (RESTORE) “The lower-elevation areas of the watershed were once the most biologically productive, but that’s where humans settled. You see a high return on investment on restoration efforts in this area, and by its very nature, it’s all on a local level. Wood boasts a corner office, but not the way you’d imagine. It’s at one end of a horseshoe and has no doors. Several trout prints adorn one wall, and there’s a framed fly called “Old Glory” that mimics an American flag. In one corner sits an oar and a few old fishing rods. One curious print shows a white whale pierced with harpoons—“That’s how I feel some days,” Wood joked when asked about it. Wood travels about 40 percent of the time, speaking at land-use conferences, visiting chapters and retail partners, and, occasionally, fishing with potential large donors. When he’s in Arlington, he tries to leave several hours unscheduled each day to work on priority projects—like beating back efforts to build Pebble Mine, a gold mine near Bristol Bay in southwest Alaska that could potentially decimate the world’s largest run of sockeye salmon. After leaving himself a reminder to respond to a letter from Supreme Court Justice Neil Gorsuch about a fishing trip on the Potomac, Wood drove me across the Key Bridge to Georgetown for baseball practice. Wood and his wife of 15 years, Betsy, have three sons—Wylie (14), Casey (11), and Henry Trace (8). Wood coaches or has coached for all three boys’ basketball and baseball teams, and this evening it was Henry Trace’s team on the diamond. After practice and hamburgers with Betsy and the boys (it’s common for any out-of-town TU visitors to be welcomed into the Wood home), we sat in the living room and discussed a topic near and dear to Wood: public lands. “The federal government’s current efforts to transfer public land to state ownership is a cynical attempt to sell off these lands,” Wood said. “As federal lands, they’re mandated for multiple use, which can range from commercially harvesting trees [with appropriate permits] to hunting and fishing. State lands are mandated to generate revenue. So when a governor of State A is faced with a budget shortfall, she has two choices—sell an asset or raise taxes. You can guess what happens.” To date, Nevada has lost 99 percent of its state lands; Oregon 40 percent; Colorado 35 percent. If you review maps that show where native trout populations are strong, it’s almost all on public lands. The urbanization of America has increased our psychological remove from our public lands. “A generation ago, 60 percent of us lived in rural areas; now, 80 percent live in urban/suburban areas,” Wood continued. “Many are more concerned with gadgets than the outdoors. People don’t understand the value of public lands or how they work, and apathy sets in. When someone with a hidden agenda says, ‘We ought to manage these lands locally, rather than by some nameless/faceless bureaucrat in Washington,’ many will say, ‘That kind of makes sense.’ And then our public lands are sold off.” In 2017, Trout Unlimited launched a massive public education campaign to alert the outdoor recreation community about how important public lands are to their passions—and to make themselves heard on this issue. “Such attempts at land grabs occur every generation,” Wood added. “It’s the Transfer Movement now. Before, it was the County Supremacy Movement; before that, Wise Use. I liken it to the emergence of cicadas. Every 15 years or so, this notion emerges, makes an awful mess, and then goes away for another 15 years.” Among other elements, the 2017 campaign highlighted 30 great outdoor recreation sites on public lands across America, under the rubric “Public Lands: Best. Idea. Ever.” Since the campaign began, at least 50 state transfer bills have been defeated or forestalled. A sunny Tuesday afternoon found Wood and me in a rowboat on the Potomac near Fletcher’s Boathouse, an institution among Washingtonian anglers. We’re there partially so he can show me the river’s fabled shad run, partially so he can get a leg up in the Potomac River Wild Fish Challenge. The competition, which is open to a field limited to Trout Unlimited staff, trustees, and distinguished alumni, was established in 2011. The angler to catch the greatest number of species in the lower Potomac (carp, gar, catfish, largemouth bass, smallmouth bass, striped bass, American shad, hickory shad, crappie, and snakehead) on a fly rod is declared the winner; your catch must be documented with a photograph. “You need a plan, as you have to be out there when the fish are there,” said Vice President for Eastern Conservation Keith Curley, another former football player with a competitive streak. “For example, the shad are only present in April and May.” The trophy, which resides on a file cabinet near Wood’s corner, is engraved with two names—Chris Wood and Keith Curley. As we cast our flies toward the river’s south bank and let them swing downstream, Wood shared his thoughts on conservation. “Many people think that conservation is about land. It’s not. It’s about people, and developing trust so we can take steps toward good outcomes. “There are red-light issues—really difficult ones that divide people—and green-light issues, which are easier to resolve. And lots in the middle. Many conservation groups spend 90 percent of their time on the red-light issues, arguing. We like to first tackle the green-light issues, then the amber ones. Once we develop trust and relationships, then we’ll approach the more divisive issues. We need to get people more intimately connected to the lands and waters that sustain us, and you can’t do that by shouting at people. Get them out to experience the resource, or become friends with those people, understand their perspective and why they feel how they do. I hope to leave people who might be on a different side of an issue feeling that while they may not always agree with me, they know I’ll hear them out. Almost on cue, Wood’s rod doubled over, and he was fast to a hickory shad. He held the fish for a moment, snapped a photo, and gently returned it to the Potomac. He was one step closer to another nameplate on the trophy. The White Mountain National Forest comprises over 750,000 acres in eastern New Hampshire. Those willing to hike a bit into the remote mountain streams here will find native brook trout quite willing to take dry flies. For such intimate waters, it’s important to approach pools stealthily—and to make the first few casts count, as fish will easily spook. The Monongahela National Forest stretches over 919,000 acres of rugged, mountainous terrain along the eastern edge of West Virginia, and contains almost a thousand miles of rivers and streams . . . many holding native brook trout. The larger rivers in “the Mon” also hold wild rainbow and brown trout, and a few—like the Greenbrier and South Branch Potomac—also offer first-class smallmouth bass angling. The Smith River flows some 120 miles through west-central Montana. It’s renowned for its oversize brown and rainbow trout. Much of the Smith runs through private lands, but a 60-mile section has publicly accessible campsites available to boaters lucky enough to draw a floating permit. In places, limestone walls rise 300 feet from the river. Big browns like to rest in the ledges below those walls, waiting for food—or well-placed flies—to drift by. The North Umpqua River is a river of astounding clarity that flows through the foothills of the Cascades in southwestern Oregon. The quarry here is steelhead, an oceangoing form of rainbow trout. The North Umpqua’s 31 miles of fly-fishing-only waters have attracted presidents and other potentates for over 80 years. You’ll likely log several fishless days before getting the big tug of a summer steelhead—but the thrill is worth waiting for.